Tomato, a pulpy nutritious fruit commonly eaten as a vegetable, is another wonderful gift of the Mayans. This humble vegetable of Central America has seized the attention of millions of health seekers for its incredible phytochemical properties. Interestingly, it has more health-benefiting compounds than that of an apple! Botanically, tomato belongs to Solanaceae or nightshade family of common vegetables, which also includes chili peppers, potato, eggplant, etc. Its scientific name is Lycopersicon esculentum. This exotic vegetable of all seasons is native to Central America and was cultivated by the Aztecs centuries before the Spanish explorers introduced it to all over the world. Many hundreds of cultivar varieties with different type and size, either organic, hybrid or genetically modified are being in use. Most cultivars produce red fruits; however, a number of cultivars with yellow, orange, pink, purple, green, or white colors are also a common scene. Heirloom tomatoes tend to produce more natural and flavorful fruits. Heirloom types are becoming increasingly popular, particularly among organic producers. They are now grown worldwide as the front line vegetable in line with onions, chili, potato..etc. Cherry tomatoes (Solanum lycopersicum var. cerasiforme) are small, round, cherry-sized fruits of the same Solanaceae family. They are quite popular in Mediterranean regions, feature commonly in Italian and Greek cuisine. Tomatoes are one of the low-calorie vegetables; hold just 18 calories per 100 g. They are also very low in any fat contents and have zero cholesterol levels. Nonetheless, they are excellent sources of antioxidants, dietary fiber, minerals, and vitamins. On account of their all-around qualities, dietitians and nutritionists often recommend them in cholesterol controlling and weight reduction diet-programs. The antioxidants present in tomatoes are scientifically found to be protective of cancers, including colon, prostate, breast, endometrial, lung, and pancreatic tumors. 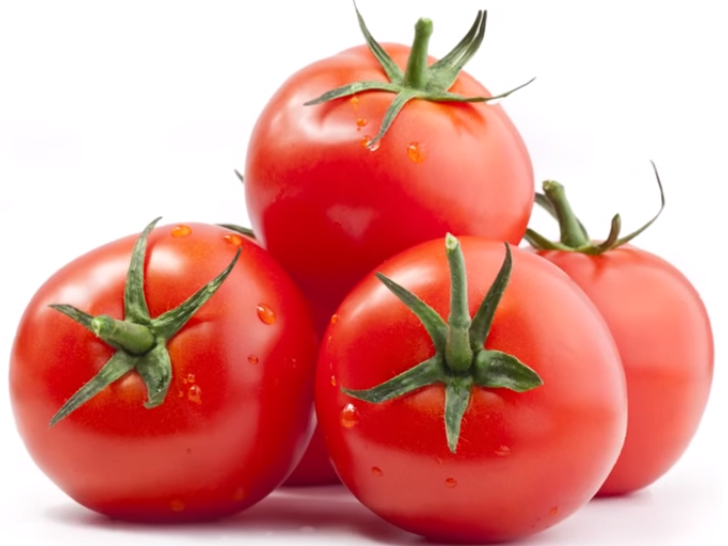 Total -ORAC (Oxygen Radical Absorbency Capacity) in this vegetable is 367 µmol TE/100 g.
Lycopene, a flavonoid antioxidant, is a unique phytochemical present in the tomatoes. Red varieties are especially concentrated in this antioxidant. Together with carotenoids, lycopene may help protect cells and other structures in the human body from harmful oxygen-free radicals. Studies have shown that lycopene protects the skin from ultra-violet (UV) rays and thus offers some defense against skin cancer. The vegetable contains very good levels of vitamin A, and flavonoid anti-oxidants such as α and ß-carotenes, xanthins and lutein. Altogether, these pigment compounds are found to have antioxidant properties and take part in vision, maintain healthy mucous membranes and skin, and bone health. Consumption of natural vegetables and fruits rich in flavonoids is known to help protect from lung and oral cavity cancers. Additionally, they are also a good source of antioxidant vitamin-C (provide 21% of recommended daily levels per 100 g); consumption of foods rich in vitamin C helps the body develop resistance against infectious agents and scavenge harmful free radicals. Fresh tomato is very rich in potassium. 100 g contains 237 mg of potassium and just 5 mg of sodium. Potassium is an important component of cell and body fluids that helps controlling heart rate and blood pressure caused by sodium. Further, they carry average levels of vital B-complex vitamins such as folates, thiamin, niacin, riboflavin as well as some essential minerals like iron, calcium, manganese and other trace elements.